Are you still using an old or beta version drivers? Those faulty drivers may cause compatibility problems. They are the biggest hidden problem that causes systems to crash. A suitable driver can improve system performance by 50% or even more. There are more than 160,000 device drivers in the database of Driver Genius, including Motherboard, Sound card, Video card, Network card, Modem, Mouse, Keyboard, Scanner, Printer and Digital devices etc. With one click, Driver Genius will work out all drivers that need updating. All drivers we offer are official versions or WHQL versions, you can use them without worrying about compatibility problem. Please click 'Start Scan' button to scan for driver updates. Driver Genius will check the driver database version automatically when scanning driver updates. 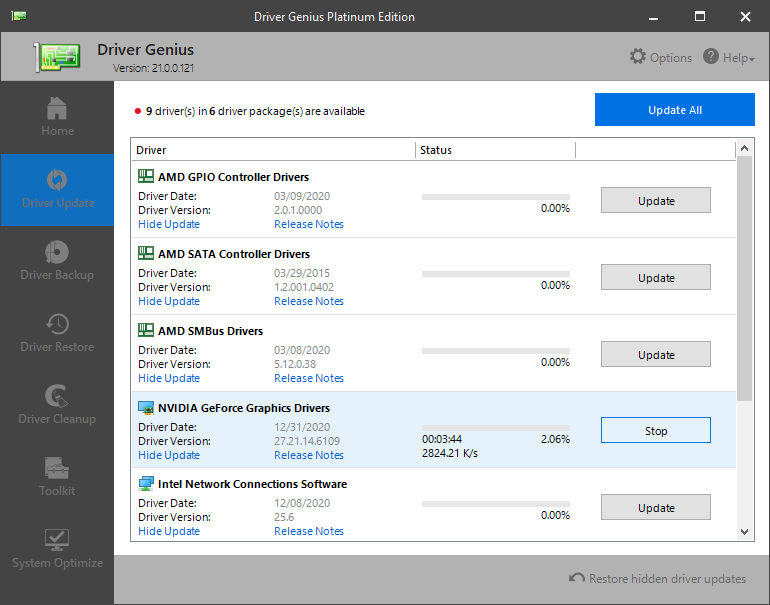 Driver Genius can recognize over 160,000 devices and offer their latest version drivers. It can recognize the devices even you don't know their model and type. 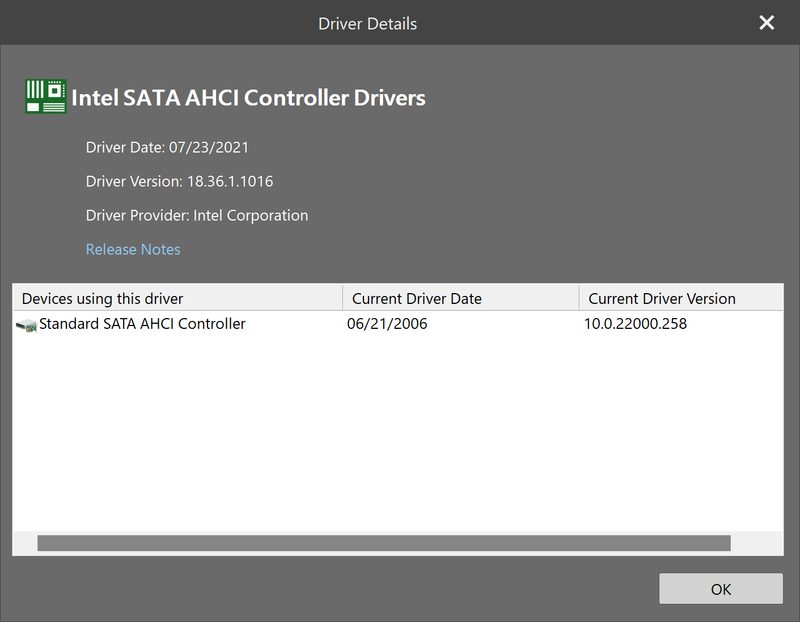 A last scan driver updates log also shows here, click a driver name to view the driver update details. You can find all the updated drivers by clicking 'View update history' button, click the 'Reinstall' button beside each driver name to install the driver update again at any time. Click 'Update All ' button to automatically download and install new drivers for your system. You can also click the 'Update' button besides each driver to update some drivers individually. To view a driver's provider, date, version information, click 'View driver update details' below each driver. Click 'More details about the driver update' to check the driver release notes that detail the corrections, changes or enhancements made to the service or product the hardware company provides. If an update procedure failed because of a network problem or because it was stopped, you can resume updating where it left off. Just click the 'Update' button besides the driver to continue updating it. Please right click the driver update and choose 'Hide this driver update' if you don't want to update a driver. You can also click the 'Restore hidden driver updates' button in the lower right corner to restore it at any time. The hidden driver won't be listed in the update driver list until there is a newer version driver is available. Click ‘Options' --- ‘Auto Update' to define a schedule for the driver auto update. 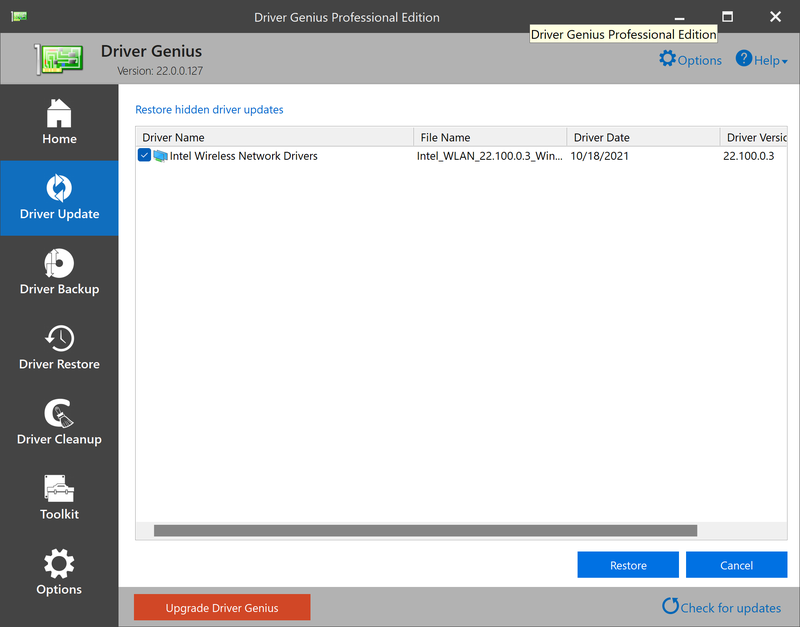 Driver Genius can scan driver updates and download, even install them silently in background automatically when they are available. The Auto Update scheduler will run at scheduled intervals. When Windows loads, it will automatically run the driver update process according to users' will. 3. 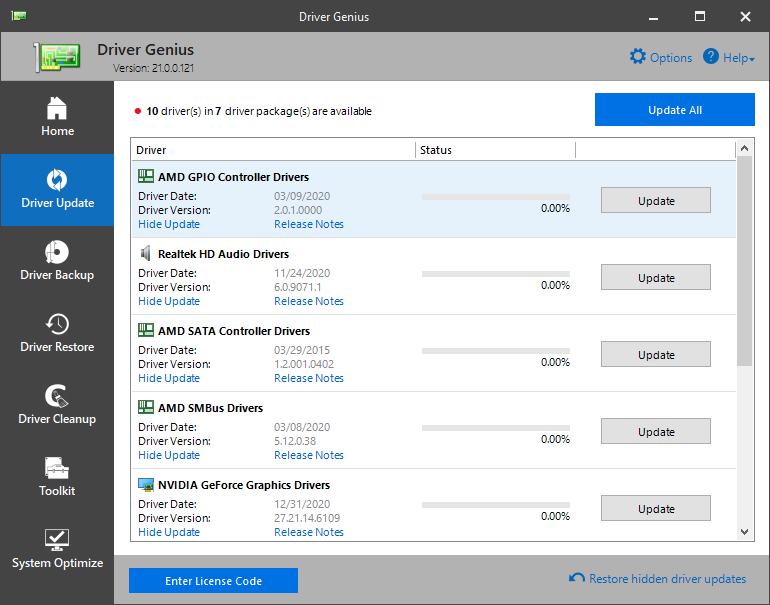 Commonly, most of drivers can be installed silently by Driver Genius after clicking the' Update All' button. But some drivers just can't be installed silently because of their own reason. For example, the Qualcomm Atheros network card driver. This driver can't be installed silently by Driver Genius, you have to install it manually. Click the 'Install' button after the driver was downloaded completely, then leave the rest to Driver Genius. The program will install the driver automatically at this moment. Windows and other windows buttons are trademarks or registered trademarks of Microsoft Corporation in the United States and/or other countries. Copyright©2002-2019 Driver-Soft Inc. All rights reserved.